As an abolitionist organization, Critical Resistance supports abolitionist reforms to dismantle the systems of policing and works to create viable alternatives in our communities. Please check back for resources as we update this page. Policing is a social relationship made up of a set of practices that are empowered by the state to enforce law and social control through the use of force. Reinforcing the oppressive social and economic relationships that have been central to the US throughout its history, the roots of policing in the United States are closely linked the capture of people escaping slavery, and the enforcement of Black Codes. Similarly, police forces have been used to keep new immigrants “in line” and to prevent the poor and working classes from making demands. As social conditions change, how policing is used to target poor people, people of color, immigrants, and others who do not conform on the street or in their homes also shifts. The choices policing requires about which people to target, what to target them for, and when to arrest a book them play a major role in who ultimately gets imprisoned. Our Abolition of Policing Workshop is publicly available – Get it Now! Included in the workshop is a facilitator’s guide, definitions, our “Origins of Policing Timeline,” and resources that we hand out at the end of our workshop. Contact us if you have any questions or would like more information on the workshop. A toolkit that shares basic health skills and emergency response practices, geared towards reducing reliance on policing and to buffer against the harms of law enforcement arriving with other 911 emergency response teams. 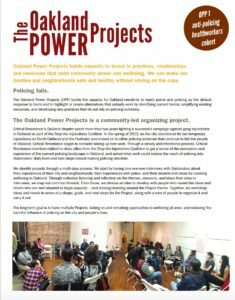 Based on workshops and materials developed by the Anti-Policing Healthworkers Cohort of The Oakland Power Projects. 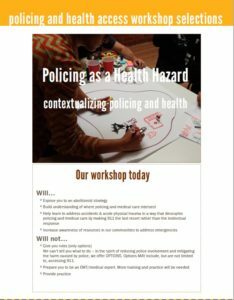 Organizers, community members, or health workers who want to skill up and reduce the harms of law enforcement. Also a great primer on policing! View the PDF online or email us for a print version. You can also print this one on 8.5×11 paper yourself. Organizers, community members, & anyone grappling with ways to demand practical steps towards ending the violence of policing. View the PDF online or email crnational@criticalresistance.org for a print version. You can also print this one on 11×17 paper yourself. 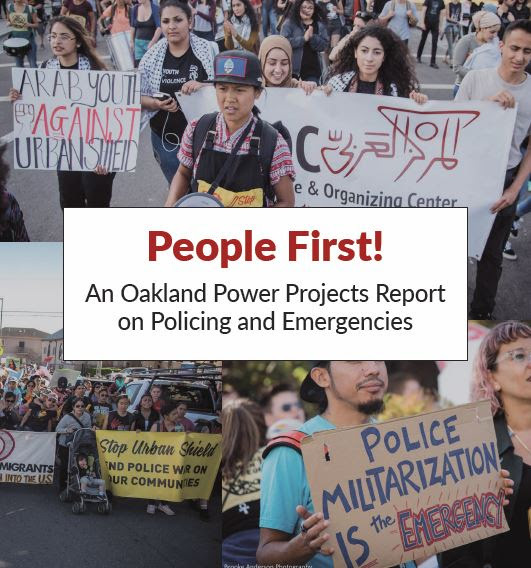 A report that explores the real emergencies that communities of color in the Bay area face and recommendations for people-centered emergency preparedness programs. Organizers, community folks, anyone grappling who wants to think about skilling folks up without relying on miltiarization and policing. View the PDF online. You can print this one on 8.5×11 paper yourself. What is Policing? How Does Criminalization Work? Isaac Ontiveros and Rachel Herzing—“From BART to SWAT: Reflections on Anti-Policing Organizing in Oakland” in Left Turn, July 1, 2009. Rachel Herzing–“Resisting the Bratton Brand: Lessons from the US” Institute of Race Relations, August 24, 2011. Rachel Herzing—“Unraveling the Fraying Edges of Zero Tolerance”, Counterpunch, January 14, 2013.